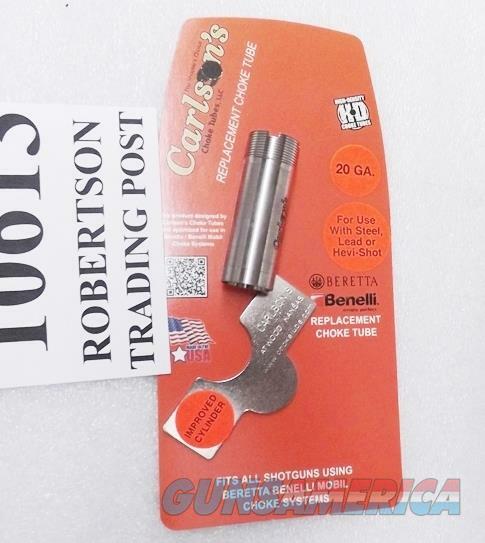 Carlsons 20 gauge .610 Improved Cylinder Stainless Mobil Choke Tube 10613 Beretta Benelli All Tristar Weatherby Mossberg International SA20 Buy 3 Ships Free! Description: This listing is for ONE choke tube. Buy 3 ships free: Buy 3, or any 3 of our non gun non ammo items and shipping is Free for the entire order, lower 48. Here are choke tubes that will fit any of the following shotguns chambered in 20 gauge, with choke tube threads at their muzzle end: BSA Over Unders; Benelli Montefeltro shotguns manufactured prior to 2007, all Ethos and Nova Pump models; Chiappa shotguns; Franchi shotguns made after 1998; Mossberg SA20 semi autos; Savage Stevens 512, 555, and Gold Wing Shotguns; Smith & Wesson Turkish Import models 1020 auto, and Elite Gold Side by Side shotguns; Stoeger 3020 semi autos; All TriStar shotguns; TR Imports Silver Eagle 202 series shotguns; and Weatherby Element series SA08, PA08, PA & SA 459 shotguns. These tubes will not fit any other shotguns to our knowledge. Manufacturer and warrantor is Carlson’s Choke Tubes LLC of Atwood Kansas. Construction is entirely stainless steel. Muzzle end diameter is .610, Improved Cylinder choke tubes, for use with lead shot, steel shot, hevi or bismuth type shot, and buckshot; and tubes are so marked. They are also compatible with 20 gauge rifled slugs. Each tube comes in its factory package with flat wrench, with enclosed instruction and warranty statement card. Replacement pricing for similar tubes often runs upwards of $30 apiece or more. We’re offering the tubes in the photos, however, or their identical mates, each	for only	$ 21.00.